My brain is still in a post-virus muddle. Clarity comes in fits and starts, and then fog washes over me and my brain disappears entirely. Trust me, this is not conducive to writing. So, what should a writer do when they’re in no mind to write? I’m the first to admit that I’m no artist. A couple of years ago, while completing Julia Cameron’s excellent program in her book The Artist’s Way, one of the activities involved drawing for a week instead of writing. I was horrified. Did I mention I’m no artist? Back then, at the suggestion of a friend, I went to a Dynamic Drawing class at the Byron Bay Scout Hall (having NO idea what I was getting into – what was I thinking???). I thought it would be an ‘art class’ that would teach me ‘art’ principles, and that we would draw fruit bowls and flowers. Doesn’t every athlete benefit from cross-training? Surely this must work for creative types too? All ready to make art! 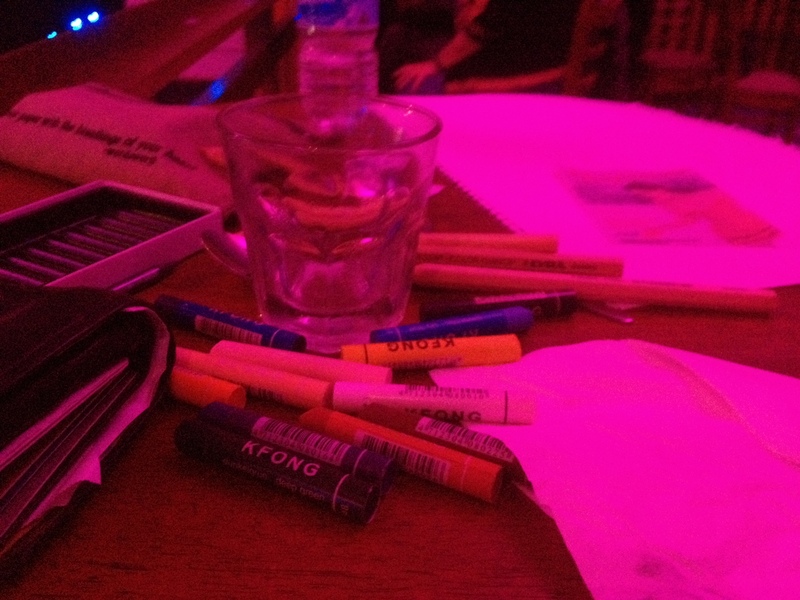 Last night, in celebration of life and its glorious possibilities, a small group of us – who are grateful for not being dead – went along to Dr Sketchy’s monthly Anti-Art School at Byron Bay. With their motto of Dames! Drinks! Drawing! and their adults-only burlesque themes, we figured it would at least be entertaining, and it was low-key enough that I could lounge around in my pale and wan state, as comfortably as if I was at home on the couch. I’m not giving up my day job any time soon, but it was fun to try something different, and to allow myself the pleasure of creating for the fun of it, with no expectation except to express myself, and satisfy my creative curiosity. By the end of the evening I had evolved from stick figures to the beginning of something a little more shapely. And discovered a new-found appreciation for the skill involved in tassel dancing. 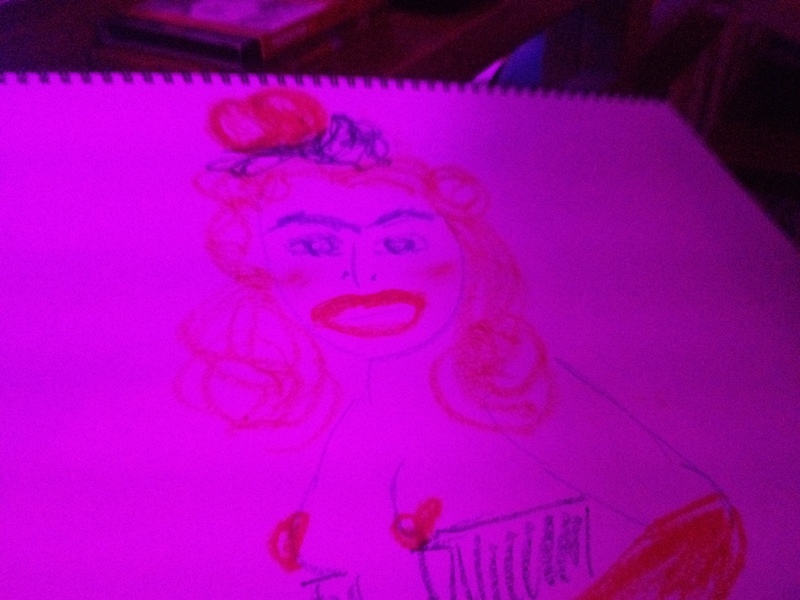 This entry was posted in Creativity and tagged art, art and emotion, arts, Burlesque, Byron Bay, Dr Sketchy, drawing, Dynamic Drawing, illustration, julia cameron, life, Ron Curran, The Artist's Way, writing by Cauldrons and Cupcakes. Bookmark the permalink. WOOT WOOT!!! I would love to go to something like that, Nic!! What an awesome idea. That sounds like so much fun! I do hope you are feeling better. I don’t know if we have Dr Stetchy here, not that I’ve heard of but then I live out in the sticks! I can imagine it being something popular in the cities, certainly. I have nominated you to he Super Sweet Blogging Award! Something different sounds like fun!